The multiplier is shipped in a hard molded plastic case. CPTM-1850S is a mechanical multiplier 5 piece set. This particular model has a range of up to 1,850 Ft-Lbs. It was developed using a precision ratio gear train which provides a smooth operation and output capacity. The complete set is supplied with reaction arms and a safety "breakaway" drive connection to protect the multiplier from over load damage. 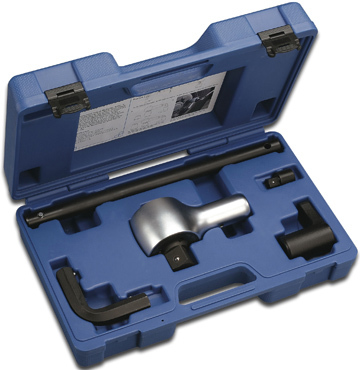 When it is used with a precision California Torque Products micrometer torque wrench high torque loads can be applied to assemblies with precision and confidence. The mechanical multipliers are supplied in a heavy duty blow molded plastic case. Torque multipliers are a necessary element in the inventory of any maintenance and repair organization.